When H&M dropped these brocade numbers a few months back, there was no question in my mind, i had to buy the set. A beautiful rich jacquard fabric in metallic blue and black gives these pieces such a luxurious feel. I will be wearing the trousers to death with fluffy knitwear through the winter season but will also rock the peplum over polo necks with long leather gloves. This is my first outfit post from my recent trip to Venice. The weather was glorious on day number one and we had ALOT of walking to do so heels were not an option. 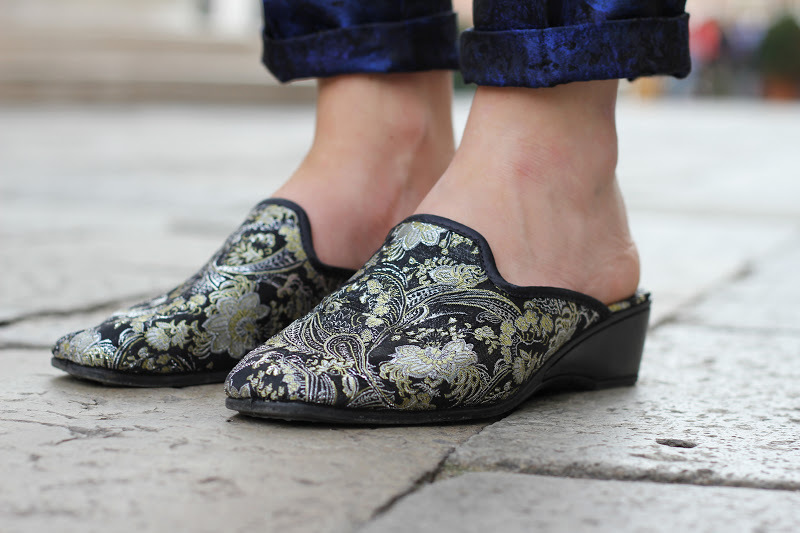 Instead i went with these embroidered slippers for total baroque overload and an old school Venetian vibe. I was so comfortable and keeping my shoulders bare meant my pasty skin got to soak up the Italian sunshine. My Celine bag was a complete lifesaver on this trip, three pockets to store maps, guide books , sunglasses and the usual rubbish us women lug around every day. Stay tuned for outfits from day 2 and 3. I like this look ... beautiful color blue ..
beautiful love the prints of both the outfit and the shoes! Pants and top are simply gorgeous! Lovely! Very cool... love the colours. The lipstick makes it!